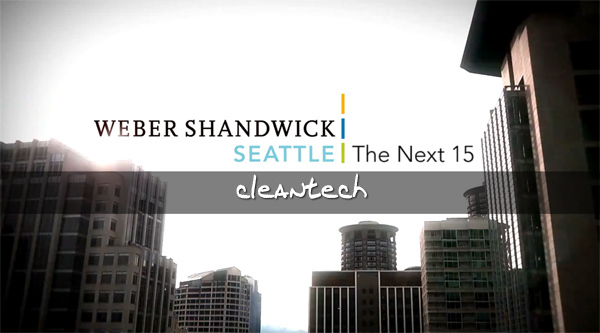 This is the sixth post of The Next 15 blog series, which commemorates Weber Shandwick’s 15th year in Seattle. Follow this series to read about our leadership team’s thoughts and predictions on seven of Seattle’s key practice areas. Fifteen years ago the cleantech sector as we know it today did not exist. Green and “clean” were relegated to the tree huggers and granola hippies of Big Sur. But as more scientific research pointed to climate change, and people realized that our oil reserves will one day dry up, a plethora of politicians, celebrities and even businesses took up the cause and began to shift the public’s view. People are starting to think differently – companies are starting to think about “greening operations,” people are exploring new technologies such as the electric car or solar panels and society is embracing new practices such as recycling – and in some cities like Seattle – even composting. Entrepreneurs realized the real business and innovation opportunities that lie within this cleantech industry (here’s a fun Cnet cleantech post on the name and its meaning…often also referenced as Clean-Tech or Greentech? )– a term used loosely to describe companies, technology and business practices relating to clean energy, green business practices or products, or technology relating to the environment. Despite the difficulty of agreeing on a singular name and branding, the sector as a whole has gained significant traction in just the last five years. For example, analyst firm CleanEdge predicts that biofuels, solar and wind technologies will grow to $349.2 billion in the next decade. And the investment community is following step with over $5.1 Billion in cleantech in 2010 – a 45.7% increase from 2009 cleantech investment, according to data provided by the Cleantech Group. In 2009, things really shifted. EVERYONE wanted to cover this “hot” darling industry and unfortunately greenwashing surfaced – leaving a bad taste in everyone’s mouth. Luckily, the pendulum is swinging back and reporters are more critical to ensure the real green technologies are covered. By 2010 most major news media outlets had a reporter dedicated to the cleantech beat and dozens of cleantech blogs sprouted. Keeping track of it all was no easy task considering all the sub categories – biofuels, renewable energy, smart grid, green building, alternative energy, batteries, and the list goes on and on. Now we’re finding reporters who cover the space but are even more specialized only focusing on 1-2 sectors within the larger industry. Here’s to exciting times during the next 15 years of cleantech communications! Tagged alternative energy, batteries, biofuels, clean energy, clean-tech, cleantech, communications, electric, environment, future, green, green building, greentech, Next 15 Blog Series, PR, public relations, renewable energy, smart grid, solar, The Next 15, trends.